As with many Wine Adventures, my recent tasting room experience at Caymus Vineyards was unscheduled and wedged in between other stops in Napa Valley. I had received a bottle of 2012 Caymus Vineyards 40th Anniversary Cabernet Sauvignon as a gift earlier this year and found it an exceptional wine. While in the area, I thought it was time to stop in and see what else they had to offer. Two things are noticed as soon as you drive in the gate: 1) the large parking lot is nearly full and 2) there are beautiful gardens outside the tasting room with tables available for reserved tastings. I visited on the last Monday of March, but it appeared like the summer rush of tourist traffic had already begun. All the outdoor seating was taken. The tasting room bar is a little small for the number of visitors it serves, but the staff is welcoming and efficient and will get you a tasting spot within a few minutes. It appeared that most of the visitors had private tasting reservations, which I highly recommend. 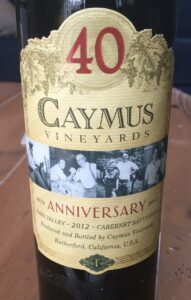 The tasting room experience at Caymus Vineyards is excellent. In addition to the wines on the tasting menu ($40 tasting fee includes the glass), the staff might offer something off the menu if you are interested in a certain varietal or type of wine. See photo (click to enlarge) for the list of all wines available for sale and the wines I included in the case I took home with me (I consider the prices a little low for the quality of wines they produce). This is one of Napa Valley’s fun tasting experiences. I’ll be reserving a private tasting in the near future and will report back on that Wine Adventure. In the meantime, stop by if you’re in the area or make a reservation. Call number above for tasting reservations or book online with CellarPass. Disclosure: Wines and other products or services described in this article were purchased by the author. The winery provided no free samples in return for this review.